Mother's Day Gift Ideas and a Giveaway! Mother's Day is fast approaching and I have some products that I would love to share with you guys which I think would make perfect gifts for Mother's Day. I apologize for the video - I was feeling a little out of it that day and unfortunately, that translated a little too well onto camera. The video is a little choppy, but I do love all the products that I mentioned and I hope it will give you some inspiration! Clarins Extra Firming Body Lotion - it smells luxe, and helps fight against ageing. How can you go wrong with this?! Clinique Fresh Bloon Allover Colour in Posy - very tiny shimmer particles in this blush help give the skin a more supple, dewy appearance. Great for faking younger, fresh-looking skin. Tom Ford Shade and Illuminate - cream products sit very nicely on dry skins (as you age, your skin tends to lose its moisture) and plumps the skin slightly. It is also very easy to use, and the highlighter is beautiful and not at all glittery. Estée Lauder Idealist Even Skintone Illuminator - dual-use products are my weakness! I love something that you can put on as makeup, knowing that it is also working on improving your skin. Kio Kio Bodycare - this eco-friendly, simple-but-beautiful range of bodycare products is ideal for anyone who wants to give a gorgeous gift without breaking the bank. These products won't empty your wallet, but smell divine and work a treat, too. 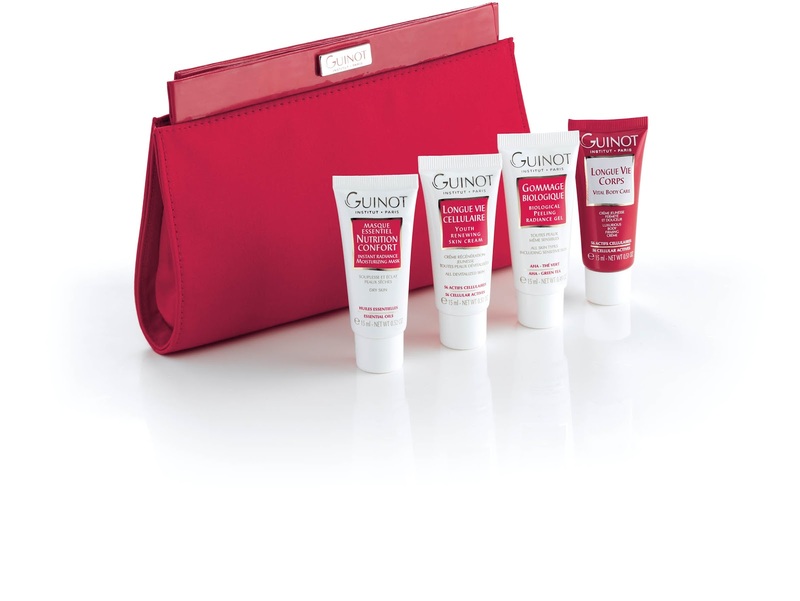 Guinot Red Clutch - featuring a selection of Guinot's star products, so your Mum can sample some of the best anti-ageing products and decide which works best for her. Read on to find out how you can win one of these for yourself or to give your Mum on Mother's Day! L'Occitane Cherry Princess Range - these are the latest release from L'Occitane - in fact they were only released just a couple of days ago! I will be doing a more detailed review on these soon, but for now, suffice it to say that Mum will be delighted with these fresh, pretty scents. L'Occitane Shea Butter Range - these are so rich and decadent, and will nurse even the driest of skins back to healthy, supple health. They come in a range of different scents, all with that yummy shea butter base scent. Now for the GIVEAWAY details! Guinot has very kindly agreed to sponsor a giveaway on Emily's Anthology, and I will be giving away 5 Red Clutch packs to 5 very lucky readers! Longue Vie Cellulaire 15ml: designed to boost the skin’s vital functions, rejuvenate the face and restore skin tone and texture. Masque Essential 15ml: drenches dehydrated skin in moisture and erases signs of fatigue. A non-setting, creamy textured mask, it is ideal for a quick boost either in the morning, before applying make-up, or before going out in the evening. Gommage Biologique 15ml: a gentle facial peel that exfoliates by softening the keratin links between dead cells. Natural and organic fruit acids then work to dissolve the dead skin cells. Longue Vie Corps 15ml: leaves the skin appearing visibly younger, smoother and softer. This luxurious cream has a smoothing, firming and regenerating action on the body. You need to be a GFC subscriber of this blog, 'Like' my Facebook page, or subscribe to my YouTube channel. Leave a comment on my Disqus comment box below (be sure to include your email!) or in the comments below the YouTube video, telling me why you would like to win a Guinot Red Clutch pack. This giveaway is only open to Australian residents or someone with an Australian address. You must be 18 and above to enter, or have obtained parental consent to participate. This giveaway will be open until the 1st of May 2012, at 12AM AEST. I will contact the winner via email or YouTube inbox, and you will have 24 hours to respond, or I will draw a new winner.